There exist more than 4,500 plant species that live as parasites on other plants. Some of them cause great damage to agriculture, even leading to the complete failure of crops. Researchers working with Dr Markus Albert at the University of Tübingen's Center for Plant Molecular Biology (ZMBP) and collaborators from the Sainsbury Laboratory in Norwich (Professor Cyril Zipfel, Matthew Smoker) have been investigating the ways in which some species defend themselves against such parasites. They looked at various tomato cultivars that can prevent the dodder parasite from latching onto them. The scientists discovered a gene in the tomato that enabled the plant to recognize the dodder and trigger an innate immune mechanism. Up to now, that kind of defense mechanism had only been observed against microbial pathogens, insects and arachnids. The results suggest that it may be possible to better protect crops against plant parasites. The researchers' study is published in the latest edition of Science. Dodder is a member of the genus Cuscuta – all of which live as holoparasites on other plants. Without leaves or roots, they wrap themselves around the shoots of mostly herbaceous, dicotyledonous plants, infecting them with penetrating haustoria, special organs that connect to the host's vascular system. They then withdraw water, carbohydrates and other nutrients out of the host. The host is weakened and usually dies without producing fruits or seeds. 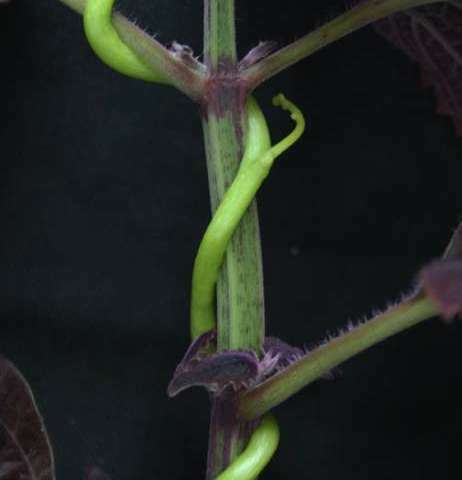 One of the few resistant tomato cultivars (Solanum lycopersicum) stops the Cuscuta haustoria from getting into its shoots by producing a corklike, woody tissue. Then the dodder dies off due to starvation. The team of researchers used crossings of cultivated tomato with a wild tomato (Solanum pennellii), in order to find and isolate the dodder-resistance gene. "This gene encodes a receptor protein that localizes to the surface of the tomato cell," says Markus Albert. "And it recognizes a molecular pattern of the dodder." Once the receptor has received the signal that the parasite has arrived, it works like a molecular switch, setting off the tomato plant's immune response. That leads to increased resistance by the host. "The tomato plant recognizes plant parasites much in the same way it perceives intruding bacteria," Albert explains. This is surprising, because the parasite and the host – as plants – are close to one another from the evolutionary point of view, "at least in comparison with the plant-microbe and plant-insect models," he says. This is the first time a mechanism has been discovered whereby a plant recognizes another plant – or its molecular patterns – as foreign. This brings a new approach into the basic research into understanding the dialogue between plants at the cellular level. "This discovery also gives plant researchers new perspectives when it comes to creating new cultivars that are more resistant to parasitic plants," Albert says.